Everything DiSC® is one of the most widely-used assessments in the world, with over 45 million users in 75 countries. Based on noted physiological psychologist and author William Marston’s 1928 groundbreaking work in the area of personality theory, the powerful DiSC framework and tools have been rigorously researched for over four decades. Today, Everything DiSC solutions provide rich and versatile learning opportunities to help people understand themselves and others. 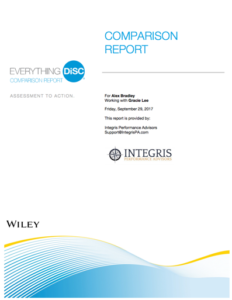 Invite colleagues who have taken any Everything DiSC assessment to share their Profile results with you to create both individual and group Comparison Reports. It’s that simple.